We look at it and say, rather than us going to America to find a long-term prospect, our long-term prospects should come out of Queensland. WHILE some clubs look abroad to find a recruiting edge, the Brisbane Lions are keeping things local. The Lions have been consistent in their message they want to have 20 per cent of their list to have come through their academy. And the signs are there that the club is on its way. Last week, in the club's heavy NAB Challenge loss to Hawthorn, key forward Jonathan Freeman took a clean mark and kicked a nice goal. Neither of those feats might have happened if not for the Lions Academy, but we'll get to that. Archie Smith was named in the Lions' squad and didn't make the final cut, but the athletic, jumping ruckman might get a chance before the home and away season, another fact unlikely without the academy. "We look at it and say, rather than us going to America to find a long-term prospect, our long-term prospects should come out of Queensland," Lions list manager Rob Kerr told AFL.com.au. "There's limitations on your resources, and I would have thought the resources we're putting in to try to convert non-traditional types in Queensland would be our go. We might have a look at Ireland, but our first preference would be to find kids in Queensland." Freeman and Smith might not be as long-term as first projected, largely due to the work of the club's academy staff. This time last year, Freeman had missed out on being drafted in 2012 and was preparing for another shot at things. Playing for local side Aspley, Freeman was able to continue as a member of the club's academy, and had another season with Queensland's under-18 side, as an overage prospect. But he was having a problem with his eyes. "He was struggling to mark the footy, and the academy guys took him to a sporting optometrist who identified there was some information processing issues with his spatial awareness," Kerr said. "They put a huge amount of time into him at the academy in terms of hand-eye exercises to correct that. On back of that improvement from the resources within the academy, he jumped up and got to a stage where some clubs ranked him as a second-round pick. 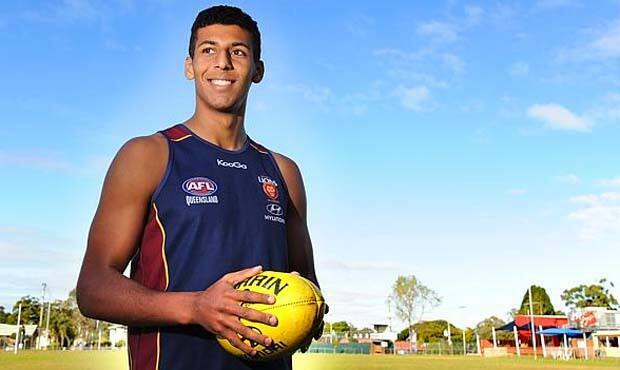 "Adelaide bid with a third-round pick (which the Lions matched to draft him with their fourth-round selection, pick 62) and he emerged as a potential AFL player. The year before he wasn't even a chance." The academy is a development and coaching program designed for players between 12-18 years from the Lions' AFL designated Queensland zones and gives them priority access to the players at draft age. The objectives for the Lions Academy are two-fold: one, to identify Queensland kids with talent and improve them as junior footballers and two, to use the program as a vehicle where they can attract some first-choice athletes to AFL football. Freeman falls under the first category, Smith the second. Smith had aspirations to follow his father, former NBA basketballer Andre Moore, into that sport. But through Ashley Drake, the academy's talent identification officer, Smith was spotted and then exposed to AFL football. He joined the academy, worked closely with Drake, academy manager Luke Curran and head coach Scott Borlace, and was recruited as a rookie last year – only months after he played his first ever game of Australian Rules. "We've looked at him purely from an athletic view and said well he's got this athletic capability, which is fairly good, are we prepared to put the time and the years in to try to turn him into an AFL footballer? The academy was able to fast-track the initial stage of that development to the point where we saw enough to say he's worth a spot on our rookie list," Kerr said. "Lets hope over a long journey he progresses further. I watched him play a practice game maybe a fortnight ago and I was probably taken aback really, just in how improved he looked. He's going to be a big, big boy." The academy works hard, however, not to simply push first-choice athletes into a new game. Kerr says the Lions would allow a basketballer to keep playing basketball while he tries his hand at footy. "If they're going to convert they've got to fall in love with the game," he says. Smith's parents recently wrote to Brisbane Lions chief executive Malcolm Holms expressing that view; their pleasure that Drake, as the first point of contact, had not pushed Smith one way or the other as he decided his sporting future and their excitement that Archie had immersed himself into the club and is loving getting better each day. But a recent 'miss' shows the struggle the club can have in attracting first-choice athletes. Fifteen-year-old prodigy Kalyn Ponga, despite training with the Lions Academy late last year, ignored the chance of an AFL career to sign with NRL side the North Queensland Cowboys. He was being chased by several NRL and rugby union sides, as well as the Lions, and was also a former schoolboy golf champion in New Zealand. "He's as talented an athlete I've seen of his age," Kerr said. "He has agility, speed, endurance and he was tough. And he was pretty single-minded in his approach. "He's interesting in terms of that being the battle we've got." The academy is putting steps in place to make sure the misses are rarer and the successes more common, keen to continue to build Queensland as an AFL-rich region. "We're looking at ways we can involve parents in the coaching side of things, to give them something so they know what a good kicking technique is, and so on," Kerr said. "That's one of our strategies, and we also want to use IT to our advantage to build a coaching website for local coaches and the like so they can be a bit better equipped in terms of drills."